NOWSHERA: Polio workers were held hostage and manhandled by locals in an attempt to disrupt the ongoing polio eradication campaign in Nowshera district. In the first incident which took place in Rashakai, three people were arrested by the police for allegedly disrupting the vaccination process by harassing female staffers of the polio teams and abusing the police staff assisting them. 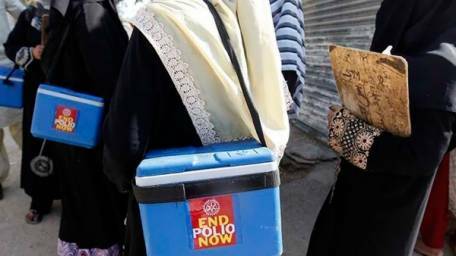 As a result, the polio eradication teams in Nowshera have reportedly boycotted the ongoing vaccination campaign in protest against harassment of female staffers in the area. The police raided the house where the staffers were taken hostage and arrested the suspects including the female culprits who had assisted them and started interrogation. Separately, Nowshera police arrested two persons who chased and teased a polio vaccination team at Kalenger Village of Risalpur. The youngsters were on a motorcycle and hurled abuses on the police staff performing duties with the team. Police said that lady health worker Pashmena of BHU was on duty at Kalanjer where three youngsters started chasing her. Police constable Amanullah, who was assisting her, said that the boys took out pistols and pointed them on him and also hurled abuses when he tried to stop them. He alleged that they were forcing the team to stop vaccination. The police then raided their houses and arrested two of them while the search for the third was underway. The Risalpur police registered FIRs of both cases and started investigation.